The move may mean a promotion to full-time coaching for Chris Jones. (AP Photo/Young Kwak) Gonzaga assistant coach Donny Daniels walks off the court after an NCAA college basketball game in Spokane, Wash., Monday, Nov. 14, 2016. Utah basketball coach Larry Krystkowiak is adding a charter member of the Assistant Coaches Hall of Fame to his staff. Donny Daniels, who spent 11 years as a Utah assistant to the late Rick Majerus, is stepping down from full-time coaching at Gonzaga after nine seasons. 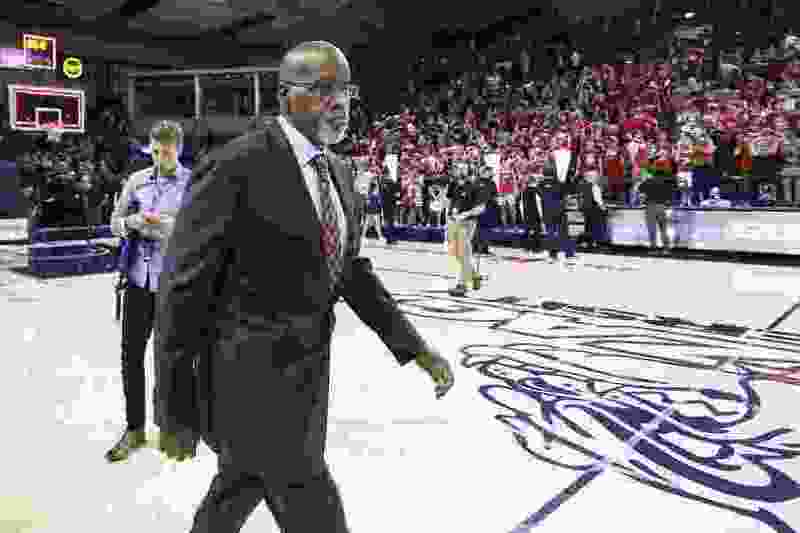 He will join Utah’s staff as a phase-in move toward retirement, he told The Spokesman-Review of Spokane, Wash.
Daniels, 64, said he didn’t know when he would start working at Utah. The school has not announced the hiring, leaving questions about his exact title and whether a new position is being created for Daniels, as Tribune sources suggest may be the case. In recruiting developments Wednesday, Texas junior college guard Taz Sherman chose West Virginia over the Utes, after visiting the Utah campus in late March. Sherman was targeted as an outside shooter who could fill the scoring void left by senior guards Sedrick Barefield and Parker Van Dyke. The Utes have offered a scholarship to 6-foot-5 guard Brendan Wenzel, a high school player in suburban San Antonio. Wenzel visited Utah last weekend. Utah also is awaiting a decision from center Jayce Johnson, who entered the NCAA transfer portal last week. The Utes need a coach to replace DeMarlo Slocum, who moved to UNLV last week after working at Utah as an assistant coach for all of Krystkowiak’s eight seasons. Daniels’ arrival could signal a move for staff member Chris Jones into full-time coaching. By NCAA rules, the director of basketball operations is not allowed to recruit off-campus or have direct contact with players during practices or games. A promotion would enable Jones to coach his son, Olympus High School guard Rylan Jones, who’s joining the program this summer. It’s also possible that Jones will remain in his current position and another full-time coach will be hired, in addition to Daniels. Former Gonzaga player Jesse Wade, now playing for BYU, endorsed Daniels as “one of the greatest dudes on the planet” in a tweet Wednesday. Daniels spent 1989-2000 at Utah, including the Final Four season of 1998, before becoming Cal State Fullerton’s head coach. Jones and Ute assistant coach Tommy Connor played for Utah in that period. As an assistant at UCLA and Gonzaga, Daniels appeared in four more Final Fours. Daniels has made 12 trips to the NCAA Tournament’s Sweet 16, including this past season when the Bulldogs played in the first and second rounds at Vivint Smart Home Arena. Daniels will be among 12 inductees into the Assistant Coaches Hall of Fame next month in Atlanta. Daniels’ son, Eric, is a Utah Valley University assistant coach. His future is undetermined, with UVU coach Mark Pope having moved to BYU and Mark Madsen being hired as Pope’s replacement.